Will Merkel Change Her Tune on Stability Bonds? Stability bonds. That is the new moniker given by the European Commission to euro bonds as it moves toward presenting its most definitive proposal yet for the debt pooling measure on Wednesday. Indeed, European Economic and Monetary Affairs Commission Olli Rehn was in Berlin on Tuesday to tout Brussels' three-option studyon how bonds issued jointly by the 17 euro-zone member states could help stem the debt crisis. 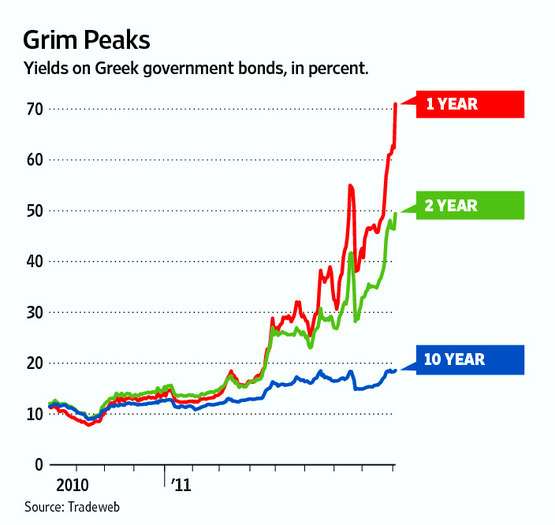 Everyone knows that Greece will default on its external debt. The only question concerns the best way to arrange it so that no one really understands that Greece is actually defaulting. In their weekly aggregate statistics, ECB announced they purchased 22 bn EUR of government bonds last week, which is a record since the austerity purchases began in May 2010 (with an "ambitious 16.5 bn EUR spent week 1). Nearly a hundred bn EUR has been spent in the last 16 months. But compared to the size of Spain's and Italy's bond markets - 2,100 bn EUR - is this just the small beginning of a pseudo EU Debt Office that has to operate in a MUCH larger scale?